If the dad-to-be in your life enjoys the outdoors, consider a dad-friendly baby carrier. Choose something neutral-colored and easy to take on and off. Soft-structured carriers can be safe and comfortable for the littlest babies, while larger, structured backpack carriers are perfect for long treks when the little one is a little older. To celebrate the father-to-be without breaking the bank, consider handmade gift certificates for services you can provide. The gift of your time and effort can go a long way toward helping a busy family adjust to life with a new baby. Go beyond the classic babysitting, and offer the dad-to-be a few weeks of lawn mowing or snow shoveling, depending on the season. You can up the ante on a babysitting offer by including a gift certificate to a favorite restaurant. If you’re a talented chef, prepare some freezer-friendly dishes that can be popped in the oven when needed. Having some real, delicious, ready-made food on hand is a relief to exhausted parents. If cooking is not your thing, a gift certificate to a local restaurant, particularly one that delivers, is helpful, too. Another idea is to put together a gift basket of favorite snacks. Don’t forget a big bag of the expectant dad’s favorite coffee. If the due date is still a little ways off, plan an outing with the father-to-be. It might be a while before his schedule allows him the flexibility to enjoy his favorite things. You might go to a concertor catch live music out, go fishing or camping, or watch a favorite sports team play. The sky’s the limit, and the outing should reflect the expectant dad’s interests. There are several classic gifts for fathers-to-be. 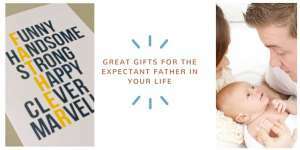 If the expectant dad in your life would like one of them, why not indulge him? Gifts could include a fine cigar or a favorite bottle of top-shelf alcohol for toasting. Another classic dad gift is sports-wear for baby representing his favorite team. You can never give expectant parents too many diapers. Find out what brand they prefer, and help them stock up. You could also pitch in for a month of diaper service. Another thoughtful, practical gift is a duplicate car seat or car seat base. Often, parents buy one, only to discover they never want to move it to another car once the base is properly installed. Buying them a duplicate seat or base will make traveling easier. Finally, help the dad-to-be get inspired by sharing these “just for dad” ideas with him. And, since babies don’t come with instruction manuals, help him feel more confident by connecting him with NewbornCourse.com, especially our section that’s just for dads. There is nothing more practical or comforting than the gift of knowledge.